West Windsor, N.J. -- Fresh from earning her bachelor's degree in Fine Arts at Alfred University in upstate New York, MCCC alum Flannery O. Miller (Fine Arts, '10) is showcasing 11 pieces she has created in her past two years at Alfred in a special exhibit entitled "Source at the MCCC Gallery June 28-July 1. An opening reception will be held June 28 from 6 to 9 p.m. In a nod to her formative two years at Mercer, the exhibit also includes a large oil painting that was her final project in a class she took with MCCC Professor Mel Leipzig. The MCCC Gallery is located on the second floor of the Communications Building on Mercer's West Windsor campus, 1200 Old Trenton Road. Miller, of Plainsboro, says she wasn't quite ready to commit to the traditional four-years-away-from-home college experience when she graduated from West Windsor Plainsboro High School in 2008. Knowing she wanted to study art, and having heard about MCCC's excellent reputation, she decided to give Mercer a try. What she found far exceeded her expectations. She recalls Fine Arts Professors Leipzig and Kyle Stevenson as particularly influential in her evolution as an artist. She also credits former faculty member Michelle Barfoot for teaching her elements of web design that are increasingly important for careers in the arts. "Mercer was the beginning of my self-discovery as an artist," Miller says. "At Mercer, I got freedom and support. I was challenged to do more." And she does. She will work from 10-14 hours straight to finish some of her larger works. She uses both oil and acrylic paint and lately has been blending the two for special effects with texture. Her canvases tend to be large -- "which allow me to flow freely," Miller says. The largest one in the exhibit measures 60" x 82". According to Miller, the transition from MCCC to Alfred was a seamless one. "I was ready and I was prepared. I felt comfortable there. It was very outdoorsy, far from the city. I found a meditative work environment where I could concentrate." Used to the small classes and the one-on-one attention that she got at MCCC, she was pleased that Alfred offered her that same kind of learning environment. Miller says, "I am intrigued by energy, color and light." She notes that her current work is inspired by natural elements. Some of the paintings in the exhibit reveal an intensive study of leaves and other depictions of nature seen under her unique microscope. An additional piece is a neon-lit "OM" sign from the Buddhist tradition. Learning to bend hot glass tubes was a thrill and a challenge, she adds. Now that Miller is back in the area, she is delighted to have the opportunity to exhibit her work at the MCCC Gallery. Gallery Director/Curator Tricia Fagan says it's a way for the Gallery to give back to a student who volunteered at the reception desk for three semesters, attracting a group of MCCC's art students who came together regularly and made the Gallery their home. Included in the exhibit is the final painting Miller completed in Prof. Mel Leipzig's class. 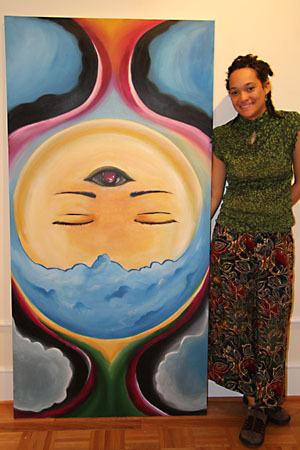 With references to "The Third Eye" from Sanskrit, it reflects themes of spirituality and transcendence. Artist Flannery Miller, right, returns to the MCCC Gallery for a special show this weekend. 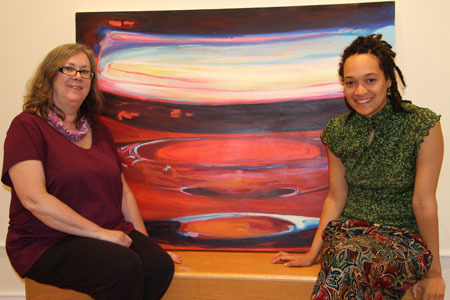 She is pictured with Gallery Director Tricia Fagan. 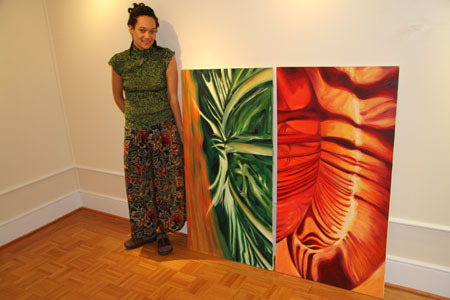 Miller with her paintings inspired by nature. 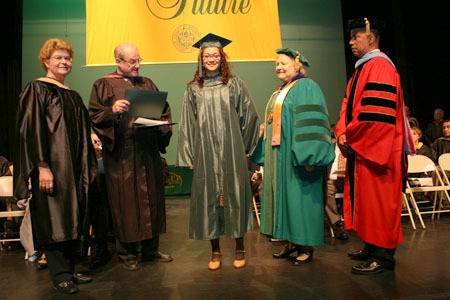 Flannery O. Miller, center, at the 2010 Honors Convocation, where she received the Jack Harris Memorial Scholarship. She is pictured with, from left, Dean Judy Ehresman, Prof. Mel Leipzig, President Patricia C. Donohue and Vice President Guy Generals. For the show's hours, click here. For Miller's artist statement, click here.